Every day we help Tampa homeowners pick out their new kitchen cabinets and countertops. 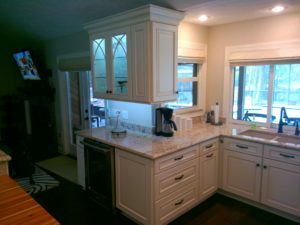 As we guide them through this process, we take great satisfaction in knowing that they are going to love the results of their kitchen remodeling project. Kitchens are a unique room in the house. It is here that family members gather for meals and conversation. At Kitchen Creations we have seen how a newly remodeled kitchen can bring families closer together and make their daily lives more enjoyable. We want you to experience this as well. When kitchen remodels go awry, the problems are often a result of insufficient planning. Before purchasing any materials – and certainly before tearing out any existing kitchen features – you will want to develop a comprehensive remodeling plan. This involves more than taking measurements and choosing a color scheme. As our design professionals in Tampa routinely explain, the first matter of business is to step back and consider the big picture. Do you expect to cook for one or two people, or large groups? Will you dine in the kitchen? What non-meal related activities will you conduct in the kitchen? A well-planned kitchen blends form and function, reflecting the homeowner’s actual purposes for the space. Tampa homes contain a wide variety of kitchen layouts, and it often makes financial sense to keep the existing floor plan. This reduces the costs associated with tearing out floors, rerouting plumbing and electrical circuits, and so forth. Nevertheless, most budgets will allow for some layout modifications, and if an existing layout is awkward or inefficient, remodeling is the chance to fix this. We help owners of smaller homes develop compact, space-saving layouts. Larger rooms allow for additional styles such as L-shaped and U-shaped kitchens. Including an island provides even more countertop and storage capacity. 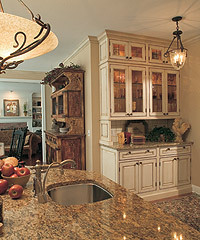 At Kitchen Creations in Tampa we carry cabinet lines that offer decorative accents such as molding and trim. For a relatively modest investment, you can enhance the look of cabinet exteriors, adding a touch of craftsmanship to the overall appearance of your kitchen. Crown molding in particular is an extremely popular option. Running the entire length of your cabinets along the upper edge of the face frames, crown molding offers a distinctive flair. Our cabinet installers are experts at working with crown molding, edge molding, and any other trim feature you may choose to include. Our customers depend on our knowledge of cabinet woods and finishes. When you visit our Tampa showroom, be prepared to learn everything you want to know about birch, alder, oak, hickory, maple, cherry, and every other type of cabinet wood material. We will explain grain patterns and how certain finishes and treatments can enhance their appearance. You can learn about wood density, and how wood color can change with age. Our goal is to assist you every step of the way as you choose the finish that is perfect for you.